Dr N. Chandrasekaran is one of the world’s most experienced yoga therapists, a western medical doctor, international trainer and author. In 2010 he founded the Viniyoga Healing Foundation of India (VHF) after more than a decade heading the Yoga Therapy Department at the Krisnamacharya Yoga Mandiram (KYM) in Chennai. In that role he conducted consultations with more than 10,000 students, with a wide range of health problems, prescribing individual practices for each. 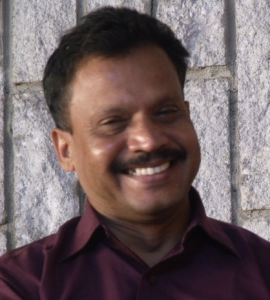 Dr N. Chandrasekaran Dr N.C. has been a practising allopathic medical physician for almost thirty years and completed his Post Graduate Diploma in Yoga in 1990. From 1991 he acted as a consultant-teacher, and from 2001 held the position of Director of Therapy at the KYM. Dr NC’s experience in medicine and in the yogic healing process enables him to practice and to present an astonishingly effective blend of the western medical system with eastern traditional wisdom, helping people with a wide range of health problems.He has taught in numerous international teacher training and continuing education programs as well as training numerous senior yoga teachers in the specialised field of yoga therapy. DR NC has authored a series of books on the practice of Yoga Therapy that are are set to become a standard reference for serious practitioners in the area. Dr N.C. is the founder of the Viniyoga Healing Foundation of India (VHF) and he is on the Council of Advisors to the Australian Association of Yoga Therapists (AAYT).